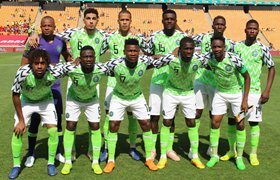 Allnigeriasoccer.com can exclusively report that Nigeria manager Gernot Rohr has just confirmed his starting line-up for Friday afternoon's 2019 Africa Cup of Nations qualifier against Seychelles. As earlier suggested by this website, the German has decided to repeat the same starting line-up which he tested in the team's final workout on Thursday evening. Deportivo de La Coruña loanee Francis Uzoho is set to make his 13th international appearance, having made the starting XI. Abdullahi Shehu's injury problems are behind him and he has returned to the starting line-up as the right-back, with Jamilu Collins playing at left-back while the two central defenders are Chelsea loanee Kenneth Omeruo and Italian-based William Troost-Ekong. John Ogu and Oghenekaro Etebo had been competing for one of the two defensive midfield positions following the return of Ndidi from a one-game ban, and it's the Stoke City man that has the nod from Rohr. The attacking midfield contains Ahmed Musa, Alex Iwobi and Henry Onyekuru, with the Arsenal star deployed in the number ten role. Former Watford striker Odion Ighalo has been preferred ahead of Victor Osimhen and Paul Onuachu to lead the Super Eagles attack.